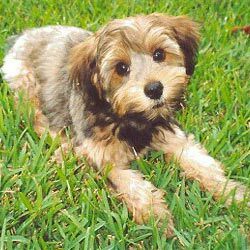 Yorkiepoo is a cross between Yorkshire Terrier and a poodle and is also known as Yo-Yopoo and Yorkiedoodle. The Yorkiepoo have a very affectionate and jolly nature, which makes them ideal for children. They are lapdogs are enjoy cuddling. They are and extremely loving family pet and are very small in size which can be imagined by the fact that it can be carried around easily in an arm or a bag. They are believed to be well-proportioned, strong and lively having a sharp way of expression. Being devote, caring, lively, intelligent, they get along well with other pets that they have been raised up with. Yorkiepoo love attention and should not be left alone for long periods of time as this can lead them to being destructive. They are vary around strangers and tend to warn their family about any upcoming visitors or sounds. They may need to be brushed daily to avoid tangling of hair and the ears must be cleaned on a regular basis to avoid ear infections. It is necessary to train and socialize them at an early age. Being extremely brainy, they tend to pick up commands quite easily. Yorkiepoos are apt for apartment living. They are very lively indoor and it is necessary to provide them with a number of safety toys to keep them busy. They enjoy play sessions with their family, long walks and off-lead play. However the latter must always be done in a fenced yard. All in all they have the personality of both their parent breeds.